Monitoring the temperature/current or oil spills in a part of the ocean. Attempting to ascertain the presence of nuclear radiation in a particular region. Deploying a network of unmanned (UAVs) in a reconnaissance mission to measure enemy presence in a region. In each, there is a need to distribute autonomous agents functioning as sensors to optimally cover an unknown environment. Algorithm design for such agents usually faces two challenges. The first is location optimization — to resolve how the agents should be ideally distributed in order to achieve optimum sensing capabilities. The second, and more important, is to ascertain the requirements in communication in order to achieve the desired optimum coverage configuration in a robust manner (for instance intervals between messages, communication topology). Rihab Abdul Razak, a research scholar with the IITB-Monash Research Academy, is working on a project titled, ‘New models and algorithms for decentralized and adaptive coverage control in multi-robot systems’ to help resolve these challenges. He aims to study advances in decentralized coverage control. 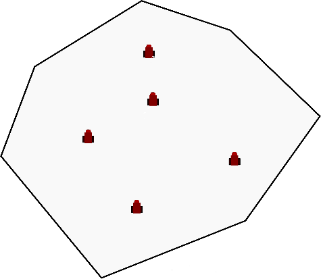 This is an important coordinated control problem wherein a set of robots identify optimal techniques to cover an unknown environment for the purpose of sensing. The Academy is a collaboration between India and Australia that endeavours to strengthen scientific relationships between the two countries. Graduate research scholars like Rihab study for a dually-badged PhD from both IIT Bombay and Monash University, spending time at both institutions to enrich their research experience.